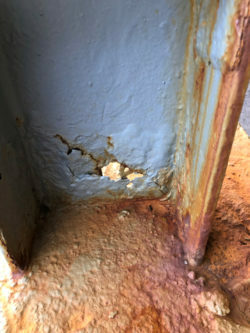 CRI recently received an after-hours call from a client who had discovered serious corrosion on some of their parking garage support columns. 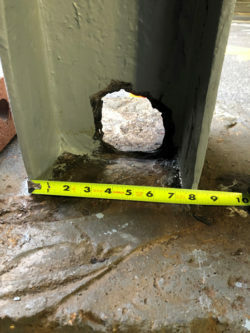 In addition to structural concerns, the discovery was made while the client was prepping to paint the bottom of the parking deck, so that work came to a halt. Responding quickly to our client’s request, we investigated the site that evening and consulted with our engineer to formulate a plan for a temporary fix that would ensure no structural issues while a design for a permanent solution was developed. We also engaged our mobile steel building installers and told them they were needed ASAP so the deck painting and sealcoating could proceed without further delay. The very next morning we were able to pick up the steel needed for the repairs and fabricated it in our shop to fit into the columns. It was then back to the site where electric chipping hammers were used to remove the rust so the steel could be welded. 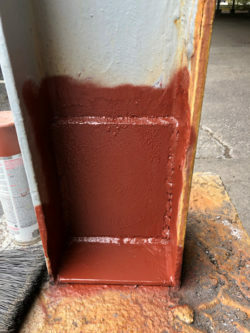 Upon deeper inspection, we found that the columns were in much worse condition then what the photos show, so we ground down all the weld locations, which enabled the welder to get penetrating welds, allowing the plates to do their job. Once the welder was done, we primed the back side of the newly installed steel, to help prevent rusting, installed the plates, ground down the welds, and primed the outside with a steel primer. 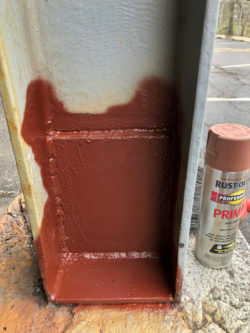 At this point, less than 24-hours after the call, our emergency repair work was complete and the client’s painter was clear to resume painting and seal coating on these sections at his convenience. As soon as our engineer completes the beam replacement plan, we will return to the site to implement it. This will entail removal of the concrete protective base, so cars do not hit the beam, and excavation down to the original base plate. From there we’ll temporarily support the parking deck with other steel beams, supported on steel plates, and install a laser receiver on the beam. The corroded section of beam can then be cut out; we’ll raise the deck a little, with screw jacks, remove the beam, and grind all surfaces down to prep for the new beam insert. Once the new beam is in place, we’ll lower deck down to the proper height as determined by the laser receiver, weld all connections, and prime the steel. We will then form and install rebar, pour concrete into the forms, and vibrate into place. After the concrete has set, we will return to strip the forms and repair the asphalt that had to be removed to facilitate work. CRI provides a large portfolio of services that includes, but is not limited to, concrete and asphalt work, commercial snow removal, water management (including sewer, water, and drainage projects), water recharge system installation, management and delivery of all phases and requirements of site-work, and professional dismantling services. For information, please call us at 908-797-2305, or submit an online form to request an estimate or receive answers to general questions.